FILE - Bottles of several opioid-based medication at a pharmacy in Portsmouth, Ohio. Virtual reality, neural feedback and digital therapy were among five ideas to help solve the U.S. opioid crisis that won a global technology challenge on Tuesday. Winners were selected from hundreds of ideas submitted by researchers, caregivers, service providers and individuals from Ohio, other states and nine countries. The winning entrants will receive $10,000 each to take their ideas to the next phase. The $8 million Ohio Opioid Technology Challenge was modeled after the Head Health competition launched by the National Football League, Under Armour and General Electric to address traumatic brain injuries suffered playing football. It's part of a two-pronged strategy Ohio is pursuing to fight the deadly epidemic tied to prescription painkillers; the state has also awarded $10 million in research-and-development grants. Besides the top prizes awarded to ideas with the highest likelihood of success, 40 runners-up — 20 laypeople and 20 technical professionals or experts — will be entered into a drawing to win $500 cash prizes. FILE - Ohio Gov. John Kasich delivers his State of the State address in Sandusky, Ohio, April 4, 2017. According to the Ohio Development Services Agency website, the state is spending $1 billion a year to attack the opioid problem. 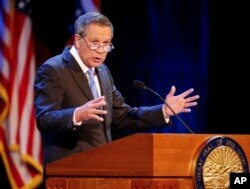 The efforts, spearheaded by Republican Governor John Kasich, came in a state among the hardest hit by the deadly opioid epidemic. There were 4,050 overdose deaths in Ohio in 2016, many linked to heroin and synthetic opioids like fentanyl. — Judson Brewer (Worcester, Massachusetts): For a digital therapy centered on the psychological theory of mindfulness, which will extend ideas contained in his nationally known Craving to Quit program to opioid addiction. — Kinematechs LLC (Cincinnati, Ohio): For an augmented reality-based interactive coaching system resembling glasses proposed by Yong Pei and the Kinematechs team that would use motion tracking to customize a surgical patient's physical rehabilitation routine once he arrives home from the hospital, reducing demand for opioid painkillers. "It's like an expert sitting right in the glasses,'' Pei said in an interview. — Lee Barrus (Oren, Utah): For an opioid risk assessment screening app suggested by Barrus and the team at InteraSolutions to identify patients with risk factors for opioid abuse. The idea is to enable medical professionals to flag at-risk patients earlier and direct them to alternatives to opioids for fighting pain. — The Edification Project (Boston, Massachusetts): For a use of virtual reality technology focused on preventing addiction in teens and young adults, framing attitudes early to prevent opioid abuse. — The University of Dayton Research Institute (Dayton, Ohio): For a neurofeedback application developed by software engineer Kelly Cashion that uses sensors to provide real-time information to patients about their brain activity, allowing them to take back control by better understanding the effects of addiction on their brains. "Some people like to play video games, or look at the sunrise. By making them do these other tasks, anything to help them distract, and by constantly measuring it, you can see what works, reinforcing it and taking back control,'' said Nilesh Powar, a senior research engineer who worked with Cashion on the project. The second stage of the challenge begins in late February and runs through July. It will seek expertise from within the business and innovation community to help advance winning ideas into solutions. The third phase will fund the most promising ideas into products for use in the marketplace.